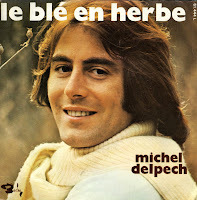 Michel Delpech was born on January 26, 1946 in the Paris suburb Courbevoie. He clocked up hit after hit in France during the Seventies. In the Netherlands, he only made the charts once. 'Pour un flirt' reached the Dutch Top 40 in the Summer of 1971 and reached number 3. This French single contains 'Pour un flirt', but oddly enough it's on the B-side. The A-side contains the unknown - at least, unknown to me - song 'Le blé en herbe'. I got this single as a present. 'Pour un flirt' is one of those songs that belong in every collection - it's an evergreen.